You’re playing a cash game, seated in the cut-off position. You have J10 suited. The blinds are 1/2 and you have $450 in chips. You made a raise before the flop to $10 and only the big blind called you, he has $300. 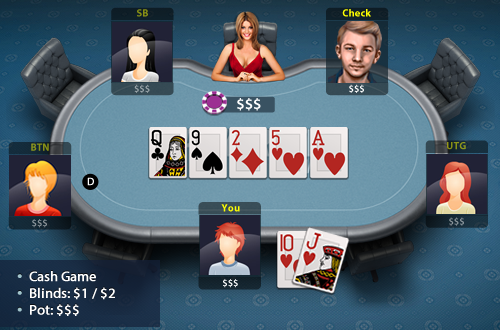 The flop comes Q92 rainbow, and you bet $15 and got called. The turn came a 5 and you bet $32 and got check called again. The river came an ace and the player checks to you again.